but even they got threatened out by someone threatening to petrol bomb their flat, niceee. 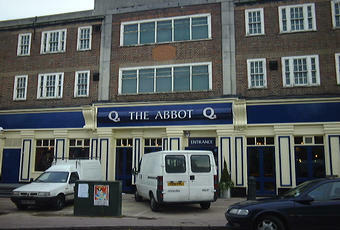 once again used to be a nice pub a few years ago before a man & his mrs and kids left.. Seemed to be close again when I went past the other day, a pub probably on its last legs and will be probably be gone for good soon if it hasn't already. This pub has opened again. The (temporary) sign outside says that it is called The Royal Surrey - the same name as the snooker club next door. Real ales available were Young's ordinary and London Pride, but I didn't have time to stop and sample the quality. As it was a weekday lunchtime the place was virtually empty, so no report on the atmosphere either, I'm afraid. I walked past and this place looked closed. I am devastated - where will the violent-looking chavs go to drink now? They will probably end up in Ganleys and ruin what is Morden's only pub worth going to.